In the winter issue of Filmmaker Magazine, I talk about how data can be used to discover, curate and create stories. I’m fascinated by the concept of marring various real-time and social data to generate a type of “storystream.” A perfect example is “We Feel Fine,” which crawls the web looking for the phrases “I feel” and “I’m feeling.” But where We Feel Fine is a document of what is actually occurring online it represents more of a hybrid documentary then a “narrative.” In terms of narrative usage I’ll post later in more detail about some of things we’re developing around my newest transmedia / feature project HiM but for now I’d like to highlight another use of social data as a communication/story path for a game. The recent release of a Sherlock Holmes’ version of TweetDeck represents an interesting usage of the streamreader. A streamreader similar to a feedreader is a way to aggregate your social feeds. The Sherlock Holmes skinned version of TweetDeck acts as a companion to the AQKA / Hide and Seek designed game 221b which leads players directly into the first scene of the film when it opens Christmas Day. 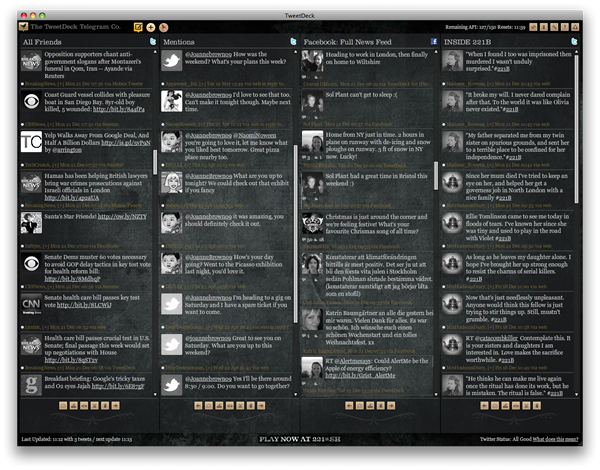 The skinned TweetDeck is intended to be a simple way to keep up with updates and the conversation surrounding the game.